Revelations last month that Google was designing software for the US military’s illegal drone warfare program have sparked outrage among employees. More than 3,000 Google workers have signed a letter to executives demanding that it end its involvement with the Pentagon. The program, known as “Project Maven,” involves the use of artificial intelligence systems to analyze drone footage, potentially assisting the Pentagon in identifying targets for drone assassinations, which have led to the deaths of tens of thousands of people, most of them bystanders, across the Middle East and North Africa. Google’s involvement in the program was reported by Gizmodo last month. The US government’s drone murder program, involving the assassination of people without trial, violates both the US Constitution and international law, implicating Google in activity that could lead to criminal prosecution. Google’s relationship with the military is in fact not new. Eric Schmidt, the executive chairman for Google from 2001 to 2017, has a position on the Pentagon’s Defense Advisory Board, along with Google Vice President Milo Medin. The letter points to the growing divide between the employees of technology companies, among the most highly-skilled workers anywhere in the world—many of whom have imbibed an ethos of opposition to concentrated power, surveillance, and the military—and leading executives determined to integrate Google, Facebook, and Twitter into the military/intelligence apparatus. While workers at technology companies are some of the best-paid in the United States, nearly all of them are compelled to work grueling schedules, regularly involving workweeks of at least 60 hours, making raising a family nearly impossible. Much of their salary is taken up by housing costs. Rents have shot up by more than 50 percent in the San Francisco Bay area, the most expensive real estate market in America. The average one-bedroom apartment rent is $3,390 per month, forcing some workers to live in their cars. Amid a growing nationwide strike wave that has led to walkouts by teachers in West Virginia and Oklahoma, technology workers throughout the San Francisco Bay Area, the United States, and the world no doubt increasingly feel themselves at odds with their employers, who lured many away from careers in the sciences with promises of “changing the world” for the better. Now, these workers are being told by these same executives to create systems for mass murder, surveillance, and censorship. The New York Times, which first reported the letter, wrote that it could not get a single employee to speak on the record, no doubt testifying to the climate of intimidation and repression within the company. As the WSWS documented in an open letter to Google sent in August, the aim of these changes was “to restrict public awareness of and access to socialist, anti-war and left-wing websites.” The consequences of the changes included a nearly 70 percent (now more than 75 percent) drop in Google referrals to the WSWS. At the time, the WSWS noted that Google’s moves to align itself with the demands of the military/intelligence apparatus would inevitably engender opposition within the company. These warnings have been confirmed. Google’s actions last year were followed by similar moves by Facebook in January, when it announced changes to its News Feed to rely on material from “broadly trusted and high-quality sources,” a euphemism for the New York Times, Wall Street Journal and other corporate news publications. Last month, Google also announced a new “News Initiative” aimed at elevating “authoritative content” in its widely used Google News section. 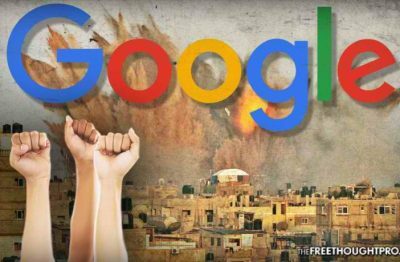 The involvement of Google with the military and its collaboration with intelligence agencies in censoring information online are two sides of the same process. As the ruling class prepares for an immense expansion of war and domestic repression, it is seeking to utilize the services of the giant technology companies. Featured image is from TheFreeThoughtProject.com.